According to Solomon Industries , the KYP series horizontal single stage centrifugal pumps are specifically designed for the pumping of thermal fluids (excluding water) at high temperatures without external cooling. The hydraulic design is in accordance with the standard DIN 24 256 (ISO 2858) for chemical pumps. Shaft sealing is by a mechanical seal in the bearing housing, which is a low temperature zone. The inner ball bearing near the casing is lubricated by the pumped liquid and the outer by grease. A safety stuffing box and a throttling area provide additional safety by minimising leakage if seal failure occurs. The main concept of the KYP series is to maximise the distance from the heated fluid to the mechanical seal and ball bearings. The mechanical seal housing and bearing support are cooled by natural convection. Pumps are available in bare shaft configuration or complete with a flexibly coupled motor fitted on a common baseplate. The shaft is designed to be able to withstand all mechanical and thermal operational stresses with minimal deflection. The bearing housing is equipped with external cooling fins. 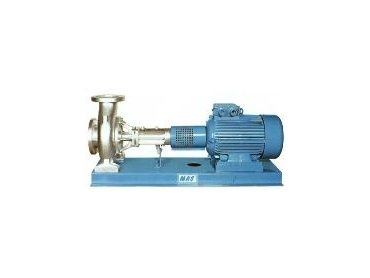 The pump is a single spiral volute type, radially split with integral suction and discharge ports including cast feet. The impellers are single entry closed type, dynamically balanced and have back vanes for the axial balancing of pressures. The casing and casing cover are nodular cast iron (GGG 40); impeller and bearing housing are cast iron (GG 25); and the shaft is 13% chromium stainless steel. The pumps can be supplied in different materials (cast steel, stainless steel, bronze, etc) upon demand. Applications include: waste heat reclamation chemical and petrochemical industries; paper mills, sugar mills; food and pharmaceuticals industries; leather industries; manufacturing of plastic and synthetic fibre; rubber industries; and general heat transfer applications 100-350C.